If your own translators are using CAT (Computer Assisted Translation) tools, you can send them translation jobs for offline editing. CAT tools offer greater productivity for translators. They often include a translation memory and glossary management, which allow translators to produce better work on shorter schedules. WPML’s support for CAT tools comes from the Translation Management module. You can download it from your WPML account, under your account’s Downloads page. You will also need the Translation Management module in order to send jobs to translators. Your translators will receive XLIFF files to edit. These files follow the XLIFF standard, which most CAT tools can handle. There are a couple more XLIFF options you can control so be sure to read the Configuring XLIFF File Options Generated by WPML article to configure them correctly. 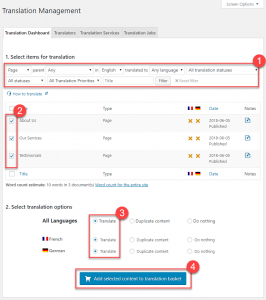 Your translators will translate offline and upload the completed translations to WordPress. The workflow follows WPML’s Translation Management. The only difference is that translators can edit offline, using their favorite tools and don’t need to translate inside of WordPress. You’ll need to configure WPML’s Translation Management. This means adding accounts for your translators. Enable sending XLIFF files in translator notification emails (see the next section). Go to WPML->Translation Management and send jobs to translators. WPML sends notification emails to your translators, telling them that there’s new work on your site. These notifications will now include a ZIP file with all the documents for translation in XLIFF format. Your translators open these XLIFF files and work on them using their favourite CAT tool. When they’re done, they click on the return URL in the notification email. From there, they upload the complete XLIFF files back. The translator only needs to upload the XLIFF file without choosing what it’s for. Each file includes the information that tells WPML what’s been translated. WPML creates the translations on your site and sends you a notification email, saying that the work has been completed. Once you’ve installed the Translation Management module, go to the WPML-> Settings page and click the Translation Notifications tab. Select the option Include XLIFF files in notification emails. When this option is selected, WPML will include a ZIP with all the XLIFF files for translation in each notification email. 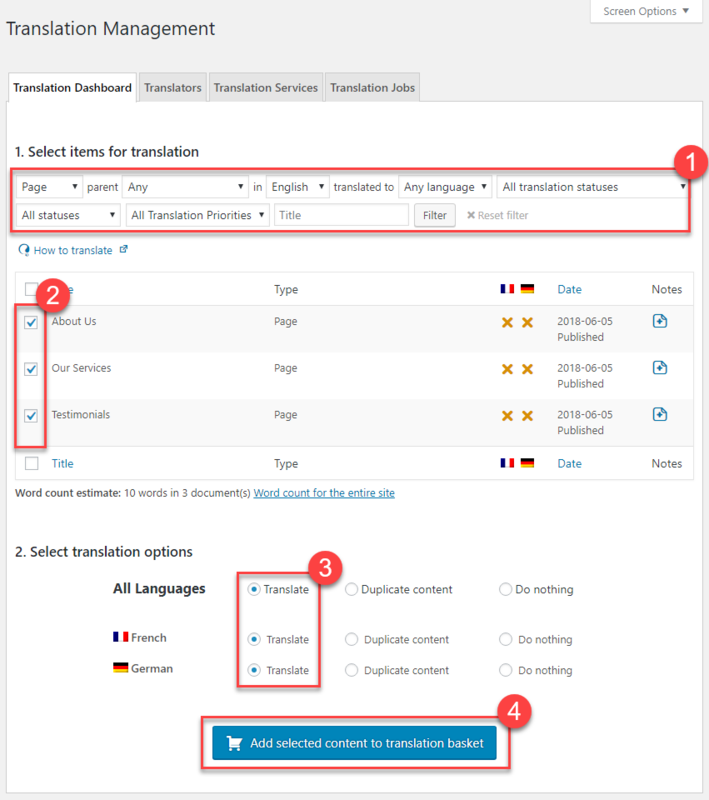 Go to the WPML -> Translation Management page, choose the documents to translate, the translation languages and the translators and send to translation. 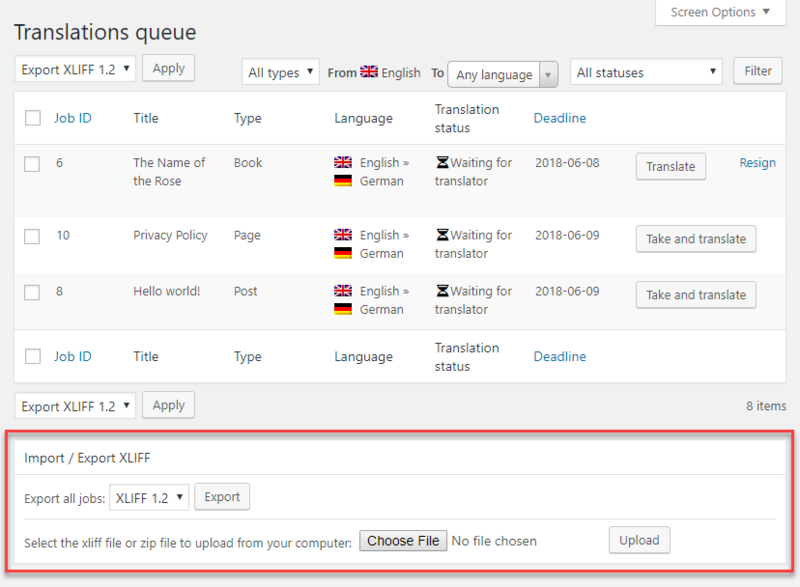 WPML will notify your translators and send them the XLIFF files to translate. Alternatively, the translators can also go to their jobs list, select the documents that they want to download and click on Export as XLIFF. The translators should download and unzip the attachment from the notification email. It will contain the different documents that you sent. They translate each of the files in their CAT tool and save. When done, the translators can upload either individual XLIFF files or create a ZIP and upload all at once. Translators can upload as many times as they like. The first time they upload, WPML will create the translations. Next time they upload the same XLIFF file or ZIP, the translations will be updated.